A big thank you to ByteNight, the IT industry’s annual sleep-out in support of Action for Children. 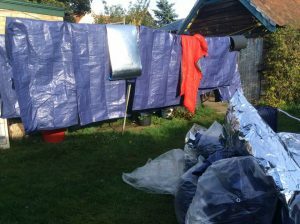 After the event, 80 tarpaulins and 80 foil sleeping bags were donated, which are now in Calais thanks to our October convoy. They will help provide shelter to the growing number of migrants there and will provide essential emergency aid for refugees sleeping outside this winter. The SOS Tents Project is designing a cheap tent that can be easily made from tarpaulin and other materials – read more about this project here.